FANBOY PLANET.com . 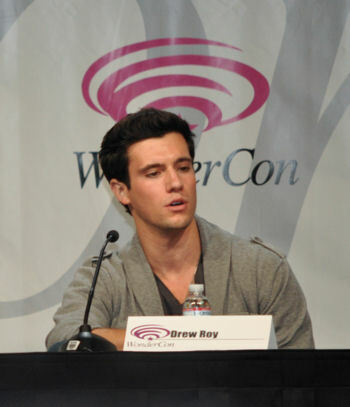 : dt-wondercon2011fallingskies :. TNT and DreamWorks present a new alien invasion series starring Noah Wyle (ER), Moon Bloodgood (Terminator: Salvation, Street Fighter: The Legend of Chun-Li), and rising young star Drew Roy (Greek, Hannah Montana) The audience in the Esplanade Ballroom where treated to some exciting new footage which started with a young boy describing the events surrounding the invasion including the death of his mother and the enslaving of other kids all illustrated via some children's drawings. Cut to Noah and Drew running through a destroyed city street some 6 months after the alien invasion; suddenly they are spotted and attacked. As they scramble to survive they must leave behind the morsels of food they scrounged together and head to a barricade of junk and trash similar to the revolution scene in Les Miserables. This is where we witness the awesome force the aliens have as the resistance fighters perched on this mountain of street trash get destroyed with a sudden laser blast. Suddenly we get to see our first alien, or "Skitters" as the humans call them, attack one of the fallen humans. They can be described as part humanoid and part arachnid (but the writers promised much more). Unable to help, our heroes instead have to witness the alien crawl all over the fallen human while belting out a loud screeching sound. Before they are discovered they must narrowly escape and regroup with other surviving humans. Further clips show the survivors trying to rescue some friends and family from the alien control, which is done by some sort of contraption secured to their backs essentially making them zombies. We also get to see how "normal" life is back at camp through the eyes of the young adults as they still recall some semblance of their past lives and potential future romances. The last scene showed the camp doctor (Bloodgood) and our father figure (Wyle) discuss the group's next plan of action. 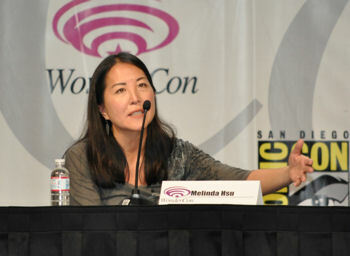 Melinda Hsu, writer ready for action!. Some interesting notes from the panel moderated by Jenna Busch which featured Drew Roy, writer Melinda Hsu (Lost) and producer/showrunner Mark Verheiden (Heroes, Battestar Galactica). •	Robert Rodat (creator) wrote Oscar nominated film "Saving Private Ryan" for director Steven Spielberg who produces Falling Skies. •	Both writers were brought on after the pilot was shot, but seemed very excited to be part of this show. •	Hsu also promised that there would not be any flashbacks a la Lost, and specifically mentioned no footage of the actual alien invasion. •	All in attendance received an exclusive "prequel" comic from Dark Horse Comics. •	There will be on-going web comics running concurrently with the series. With great special effects, a creditable creative team, and a large but very diverse cast we can hopefully expect a better offering than some of the most recent alien invasion shows on the large networks. I say to everyone, tune into the premiere and make up your own minds while they are still yours to control…. 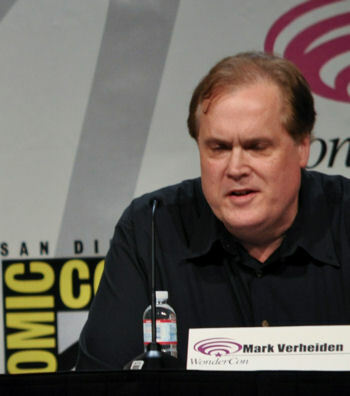 Mark Verheiden, basking in a little glory. 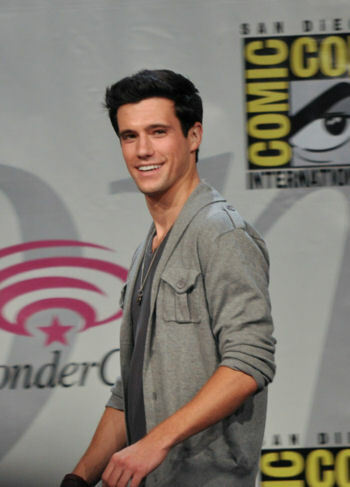 Drew Roy -- post-apocalyptic heartthrob!